It may be the case that you know that you would like to install a detailed architrave in your room, but do not have a particular style in mind. We have grouped all of our detailed architrave styles together here for your consideration. It is often assumed that detailed architrave is only suited to traditional or period homes. This is not necessarily the case, as we manufacture alternative styles (such as Asmara 3 and S4U 327) that are quite bold and perfect for the modern home. In general, architrave with more detail in the design is installed with a greater overall width than less detailed or plain styles. 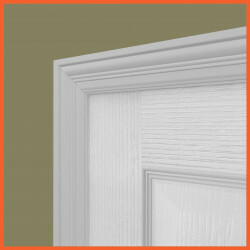 This is all subject to personal preference, but detailed architrave tends to be ordered in 95mm widths. In addition to pre-primed architrave, we also offer a finishing service that will mean your architrave arrives fully painted and ready to install. Currently we offer both gloss and satin finishes in white as standard, though we do have the capability to match any RAL colour should this be something you require. If this is something that interests you please speak to our sales team and they will be happy to advise. 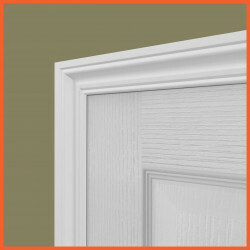 The Asmara 3 Architrave, with its bold styling and clean lines is very much a statement architrave. A well balanced fusion of modern and traditional design, the Asmara 3 integrates a square internal edge with just enough detailing to avoid being considered plain. This profile lends itself well as an accent to a simplistic interior décor.